Server has now been online for around 8 months! Server is still very popular, we're still doing updates and there's tons of new players joining everyday! in the meantime we'll have normal updates, this weekend there'll be some new tasks added and some new things in the 900+ area, and the new tasks will mainly require you to explore some new areas, instead of just killing a bunch of monsters. i'll also share some random screenshots, I always like seeing screenshots of other servers so thought I would share some! 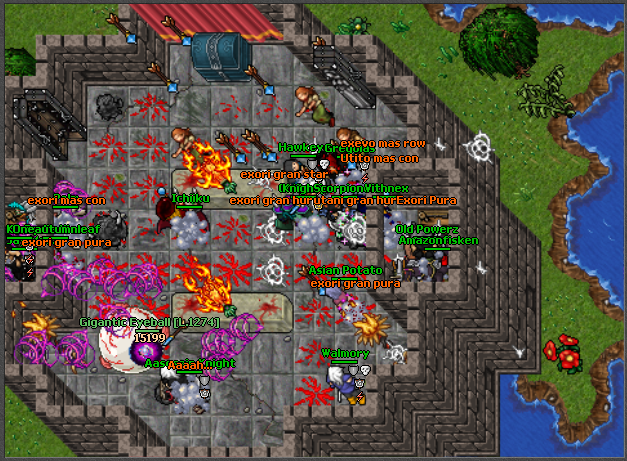 Two small bossfights, in evolunia we have many different bosses that spawn hourly, and there's some bosses that spawn daily, and some bosses are spawned as rare events. The first mythical wand (best wand currently ingame) that was dropped from a boss. Two screenshots of a quest that we added last week. Played the server for like a week or a little bit longer and I want to give my two cents about what I've encountered throughout my short journey. Started out as a knight, because I wanted to be ready to block quests for people. It was relatively easy to start up even without help, mostly soloing my way through quests and tasks even if it was somewhat slow because I wasn't that strong. When I got a little bit higher level (500+, so still pretty low compared to most people) I noticed how god awful most druids are and decided to switch from my knight to a druid to help knights in quests... but oh boy... here we go! I made my druid a little bit earlier and just magic leveled it so it wasn't freshly made so I had somewhat of a headstart. 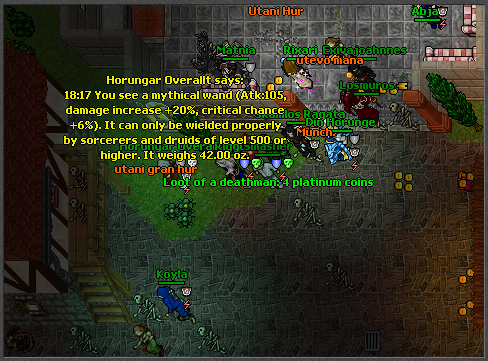 Holy moly, it was god awful to level up and do tasks as druid, maybe it was just me but at some point I would just hard die if respawn got to me or if too many just happened to be at a small spot in the spawn. I kept going even though I was majorly disappointed in the spells (and damage, but I will talk about that in a bit) of the druid vocation. It was HELL (my opinion) to get through the somewhat higher level tasks. While my knight was happily soloing tasks and quests, my druid would have to slowly kill monsters for tasks 1 by 1 or 2 by 2, sometimes even needing to overlevel myself because I couldn't deal with the tasks. Now if you don't play this server you probably would say, but it's ok you are a druid and you can just hunt with an EK and sio them for great teamhunting experience... FALSE. Nobody seems to be hunting together, even funnier most people don't even seem to be hunting at all, they are just botting. There are people botting EVERYWHERE, usually even overleveled so they 2-3 shot the monsters and make hunting & tasking for manual players awful. At first I used a relatively high hp/mp build with a lot of dmg reduction for my druid so I wouldn't just die by a monster breathing on me, but then I found out that my EK friend who was slightly higher level was outdmging me but also still surviving way, WAY better than I would. So I ended up switching to mostly damage, low hp/mp, low dmg reduction and high crit chance & crit damage. My damage is somewhat better, but I die even faster than before (obviously) it really became kill or be killed. The task system is really nice, but in my opinion could use a few extra tasks per area. Every new area my tasks seemed to run out earlier and earlier. I believe I was 485~ before all my tasks ran out so I had to grind it to 500, then it was 550 when I had no more tasks so had to grind it out to 650 and it just got worse. You could argue that I should just be hunting, but with all the bots it's not the easiest thing. I also feel that the server really needs extra stuff to do for people that don't just bot all day, people that actually want to play the server. Right now if we take in account that a person finished all their tasks all you can do is; dungeons (3 charges per day which you can finish in maybe like 30 min tops?) bosses (which just get killed in a few hits by the higher levels) daily task (maybe like 30 mins of hunting and it's done?) and hunting (with everyone botting in every spawn). The last few days I've been playing and just running around killing a couple of monsters in random spawns and then ultimately walking back to the trainer monks to go afk for the rest of the day, because I can't be bothered to bot all day or hunt manually while bots take over the spawns. 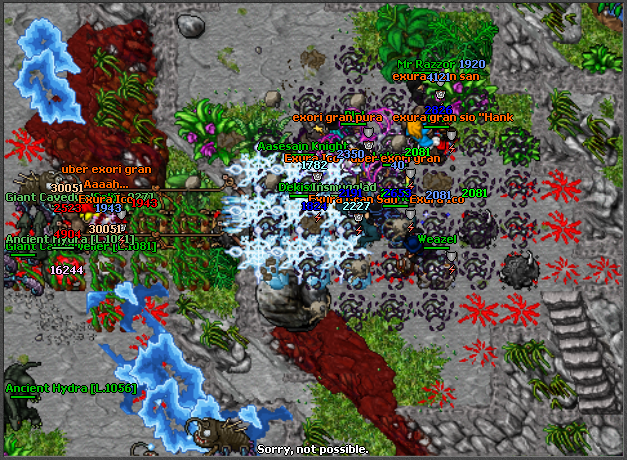 Edit: My friend wanted to join me on the server and I ended up making him not play his usual mage vocation, but make him play an EK. It's just so much easier to play an EK on this server, they have the tankiness, still decent damage, they almost never die and can mostly solo quests if they take it easy/slow. 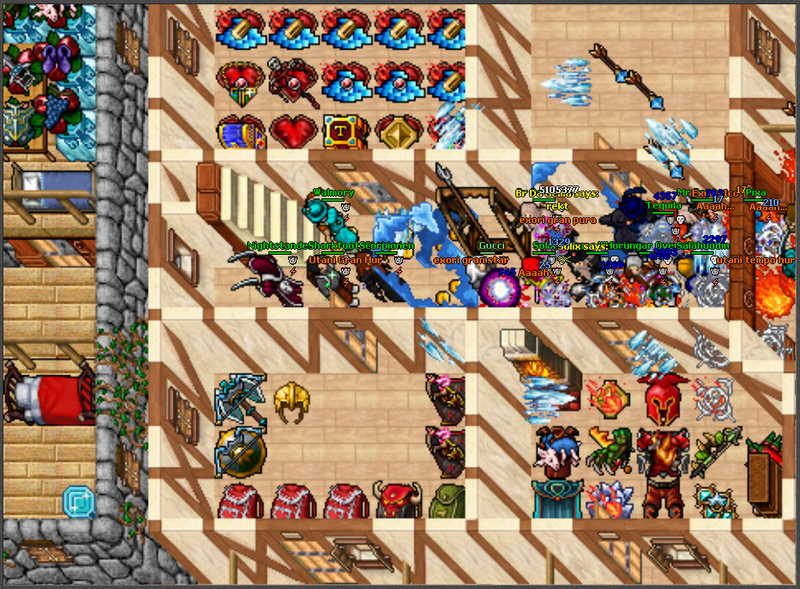 Definitely, if there is an evo server that deserves a prize, it would be Evolunia. Why? Because it's dangerous and tough. It also adds in a bit of pokemon-EV-perfection style, which is not much but still adds up if you're a high level. But unfortunately, repetitive and limited. Mostly everyone knows the best places to hunt (exp/hr), now we gotta fight for it. We gotta also sometimes fight for bosses and their loot. The loser (me) goes back to training (because I am a weakling). There is your problem right there. I bet you the majority of the server felt this emotion. Especially when you're an ant trying to finish one of those quests. It's good in a way to force the server to become social in this aspect, but what if no one helps? It's good to see the GM giving an event, but I don't think that's enough. In my opinion, evolunia should encourage/create more systems that reward players for hunting anywhere, at any level, so you won't feel like a "weakling" and at the same time it's fun, it keeps you attached. Something to also punish botters and perhaps afk-trainers (like me) by giving people who play legit some kind of reward. More like what the GM is doing, but something automatic. Anyone can join, even a level 5 can win a prize. I agree with the players, there are some balance issues here and there with vocations. But, the real focus should be what can the admin create to encourage players who die trying to finish a quest to still play the server, even if it means soloing the server without a team. Content is nice, but I'd focus on mechanics (like a stat-token system). Or whatever it maybe to kinda have fun and win a prize (almost like what DeathzOT is doing). I hope the admin gives us more fun but also lasts more years with a shop system (np2w) to keep the server running. It's in beta stage and in my eyes, it crushes other evo servers (the one's I played at least) in pieces. 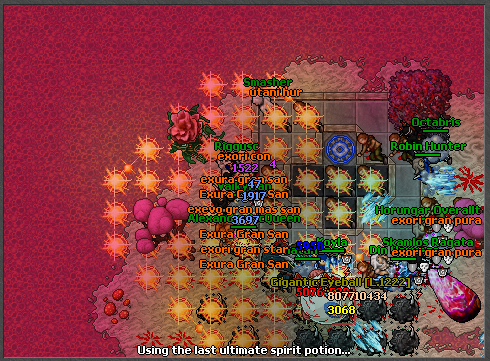 Keep it up Evolunia .